I thought I’d share how much I love these wee trees! Since we’ve got them they’ve been a huge hit with the boys. Even the husband approves so extra bonus points there too. My youngest, Loki has quite a penchant for trees. Over his 2 short years we’ve amassed a pretty lovely collection. When my eldest two boys started school I created a “seasonal display” table in our hall. We have the Grapat Perpetual calendar and weekly moons out all year round and then we use the Grimms celebration rings along with other toys and natural treasures to make a nod to the current season. It’s a great place for the boys to put all their random finds (sticks, leaves, feathers etc) and the special pictures and creations they bring home from school. I’ve been hunting Holztiger trees for years and I always seem to miss them and then one day I stumbled across Derevko on Instagram. Their feed is stunning and the toys look beautiful. I was particularly impressed with the look of the trees and loved that they can be used as puzzles and are also double sided! The pink cherry blossom tree on the right is reversible so it becomes snowy and bare. The autumnal one in the middle has lush spring greens on the reverse. I can use just 2 trees to represent Spring, Summer, Autumn and Winter! My favourite is the birch though, the shape, colours and painted details are really quite lovely. They’re just under 6 inches in height which makes them perfect addition to our table. They work really well with the celebration rings and our other goodies. I couldn’t be happier with them. We’ve also used them alongside reading our favourite book “Tree” by Britta Teckentrup. 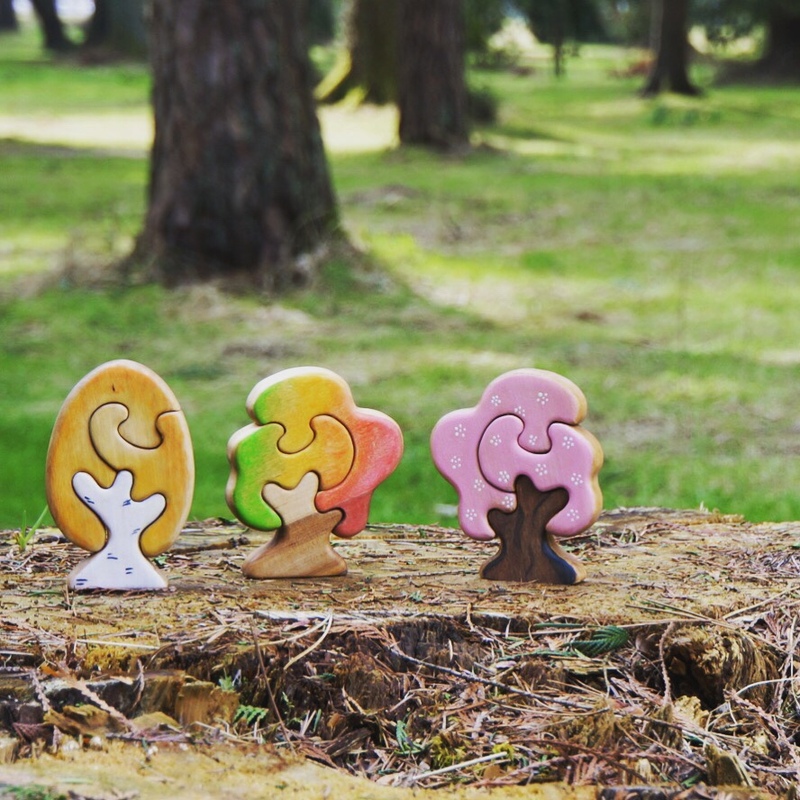 The puzzle element is great for little toddlers to explore and get to grips with. I really love that our wooden toys can be played with in a variety of ways. You really can’t beat open ended toys. Loki hasn’t quite mastered reassembly yet but he’s getting the hang of it really quickly. The range includes lots more than just trees and they’re all hand sealed with Linseed Oil which makes them incredibly tactile and hard wearing for little ones. When I messaged Derevko I got a personal reply really quickly. This is a toy maker who cares about their toys. The entire range are all hand made and finished to high standards. The painted details really are beautiful. It all actually started when they hand cut some toys as children and painted them when they were bored one day. I love that so much!